About a month back, I tried to do a thing. That thing involved trying be vulnerable, and willing to try to trust someone, in a way that I hadn't done in nearly a decade. It was terrifying and exciting and there were about 5,309,568 times when I almost nope'd out of trying. And as it turned out, that thing didn't end well. Blew up in my face, spectacularly. The person who I had been trying to trust actually turned out to be a rather cruel, creepy person who did a cruel, creepy thing that thoroughly violated the trust I had been trying to build. And to be left with that, after making the deliberate decision to push myself out of my comfort zone, to put myself at risk...to be left with that, and with no pay-off but a bitter lesson of Look what happens when you try...see where it gets you...you should have listened to all your anxieties that told you this would happen...well, it wasn't pleasant. At the end of the experience, I was left feeling utterly tricked, misled, and with an unpleasant feeling that I was nothing more than an unworthy bag of damaged, flawed goods. Well, time does its thing, and so too does the support and love of the family and friends who, as always, have rallied around me and tried to help me see that the flaw was not with me, but rather the person who violated my trust. Nonetheless, there is the lingering, bitter aftertaste of regret, and the useless vision of hindsight, and they have been weighing down upon me. I really didn't need this new crack on my already fractured spirit, acquired in this particular way. But...we keep on keepin' on. This last weekend I spent with my friend Jain up in Indy. It was a lovely weekend, and on a sunny Saturday afternoon, as we shared plates of hipster, locally-sourced food, Jain mentioned to me something called kintsugi. "It's something the Japanese do. It's a type of pottery repair," she explained in her low, soothing voice. (How does she do that? I love her voice.) "The idea is that they repair a piece of crockery with gold or silver laquer, and the cracks aren't hidden, but are visible. 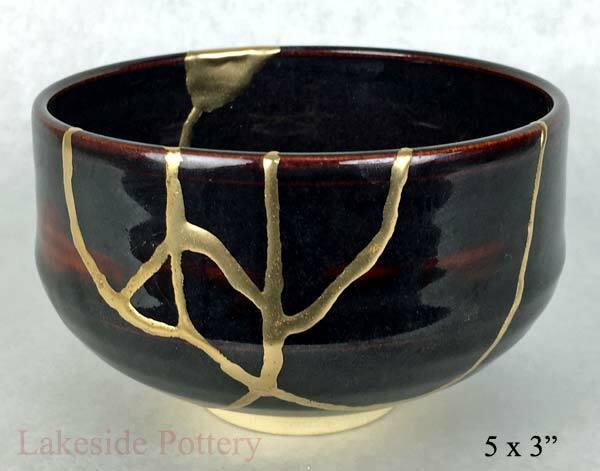 And the breakage, and the cracks, become part of the story of the object. They become part of its beauty and function." At the time, it probably really seemed like I wasn't paying attention, but I was. It really stuck with me through the rest of the weekend, and it's still on my mind now. It's a beautiful concept, especially when we apply the concept as a metaphor to our life journeys and the sorrows, traumas, and betrayals we endure. This Huffington Post article does a splendid job of summing it up. This thing that I tried, the unpleasantness that resulted...I still don't know why it had to happen to me. Perhaps it didn't, and I was simply a fool to allow it, and that's the end of it. But nonetheless, it did happen, and it caused another crack to form in my spirit. It was a small crack, given how brief the whole experience was, but significant, given its timing and the effort and courage I put into pushing myself, when all I wanted to do was hide and listen to my fears. I'm not going to pretend tha the crack isn't there. It's part of my story now. Just like all the other disappointments and sacrifices and joys and hopes that I've endured are part of my story. I'm repairing this crack, yes, and the me that will emerge from it will have another few lines of gold where the repairs are. But it doesn't mean I'm damaged goods. I wasn't before this happened, and I'm not now. I'm broken into better shape.